After our marathon climbing/cryfest yesterday, we took the day off to rest, resupply and check up on the blog. Greece is pretty much shut down on Sunday so we couldn’t capitalize on the supermarket the day before. Besides a shopping spree at the Lidl, we didn’t leave the room which was just fine with us. There was a cave pretty much right next to the door that was supposed to be pretty cool, but it had a 7 Euro entrance fee and photographs were prohibited, so we boycotted that tourist trap. 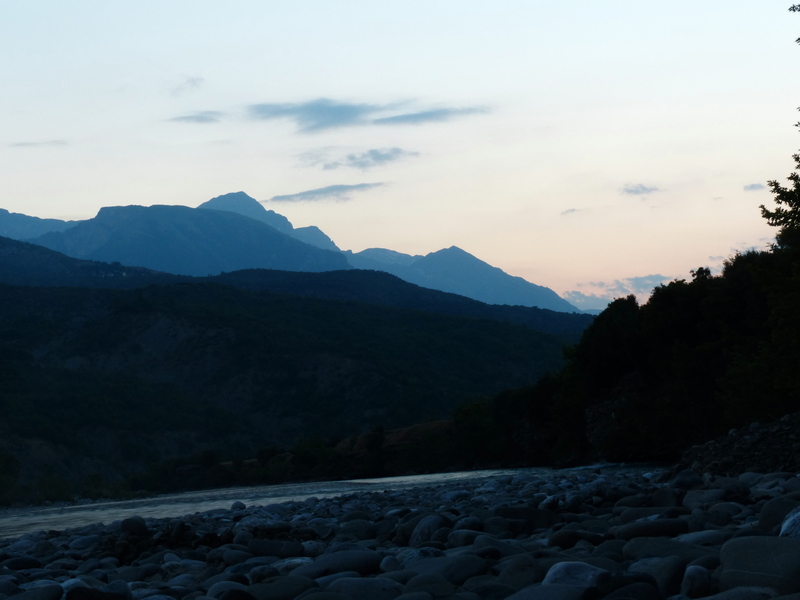 The next morning, we woke early and eager to get to Albania, the 10th country on our trip. We managed to stay off the main highway on good asphalt, so we were having a wonderful morning. We passed by old ladies herding sheep, quaint villages and wonderfully shady forests. 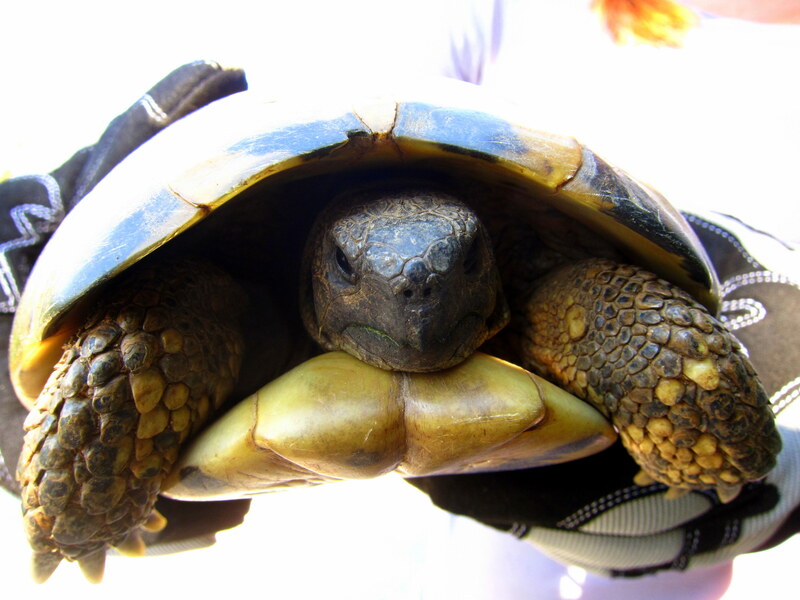 We also helped a record 4 turtles and saw an additional 2 hanging out in vegetation on the side of the road. When we reached a larger village about 25 miles into the day, we stopped for cheese pies and to do some grocery shopping. 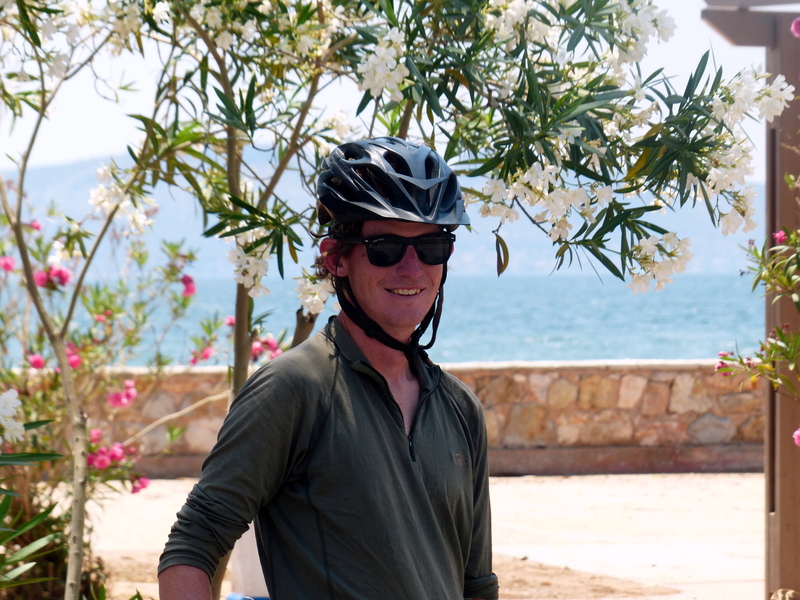 Outside of the market, we meet our first bike tourist in Greece. He was a German who had been studying in Istanbul and was on his way to Vienna to return the bike he had borrowed. 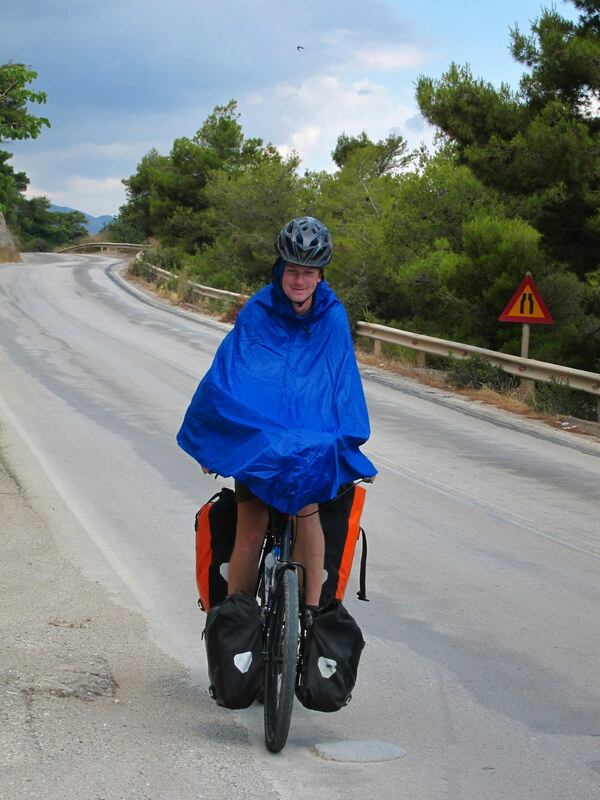 Cycle touring is apparently really popular in Europe and we were expecting to meet people on short tours, but he was the first cycle tourist we’ve come across since some Danish people in Turkey. He was pretty cynical about our GPS, and though it has sent us on some wild goose chases, it has been the most indispensable items we’ve taken along besides the bikes themselves . Paper maps can be great especially if they have topographic info, but they vary a lot in quality: in China we couldn’t find anything even remotely accurate, plus maps are expensive: $10-$15 per country adds up, and they don’t tell you where you are right now which is useful if you want to do some creative routing to escape an evil highway etc. The riding seemed to reset after our time in town and the going got tougher. We climbed another big hill with no shade in blazing heat. When planning our trip, our mantra was “to skip winter” after a few rough winters and cold rainy summers in Anchorage. Greece made me realize the wisdom of the “be careful what you wish for” idiom. I longed for it to snow or rain or to just be cloudy, anything to give me a break from the unrelenting sun. Crossing the border was uneventful and easy. After rousing the Greek border police we were stamped out. 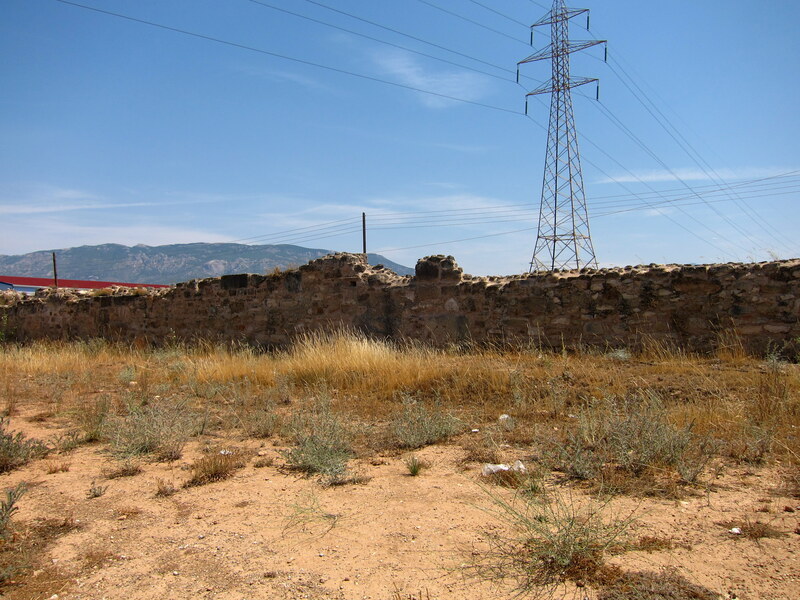 We stopped in no-man’s land at the duty-free for an ice cream before entering Albania. It is always amazing to us how obvious it is that we were in a new country. The drivers gave us a little more room, honking and waving to us. 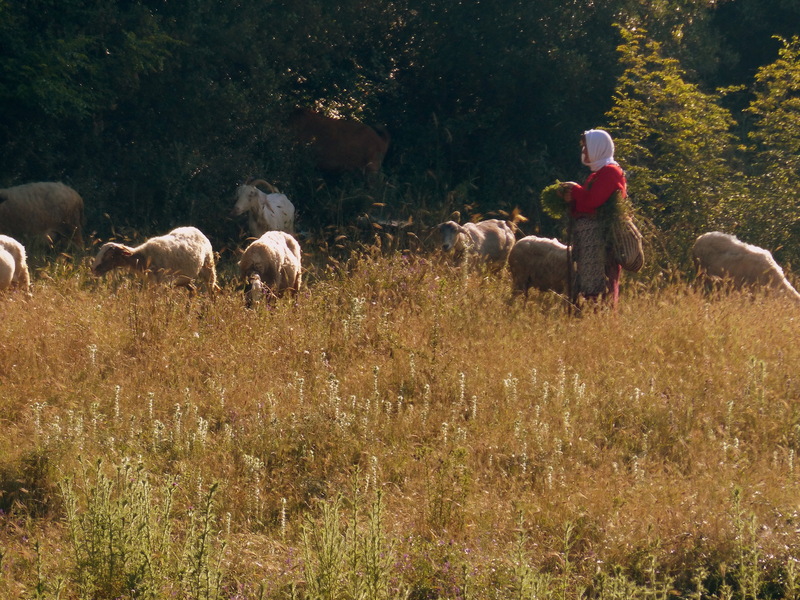 The first person we came upon was a goat herder who stared at us intently. As we passed we gave him a little wave and his hand shot up instantly as if we activated some mechanical trigger in his arm. We traveled along a beautiful and inviting river. When I noticed a little road leading down to the water, we immediately veered down to the beach. The water ended up running a little too swiftly for swimming, but it felt amazing to soak our feet in it. There were several large trees perfect for hammocks along the bank. While Chandler read, I ended snoozing for over an hour. When I woke up, I convinced Chandler that we should just camp there and be done with the day. It didn’t take much to talk him into it. We set up our tent away from the river, next to a concrete wall on top of sand. 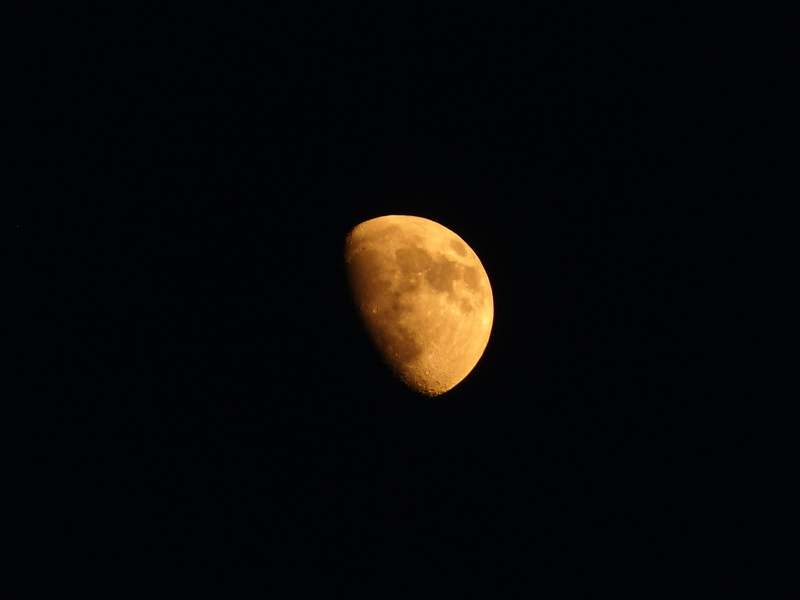 We had a few sheep dogs come down and bark at us, but otherwise the night was calm and quiet. We were excited for our first full day in Albania. With our 50 mile daily goal, we were trying to get up early to take advantage of the cool morning temperatures. After the usual morning routine, we hit the road and I actually had to wear a sweater for the first hour of the day. While the day was slow to warm, when it did get hot, it was almost unbearable. We had a little excitement right away when Chandler spotted a few turtles in the middle of the road. 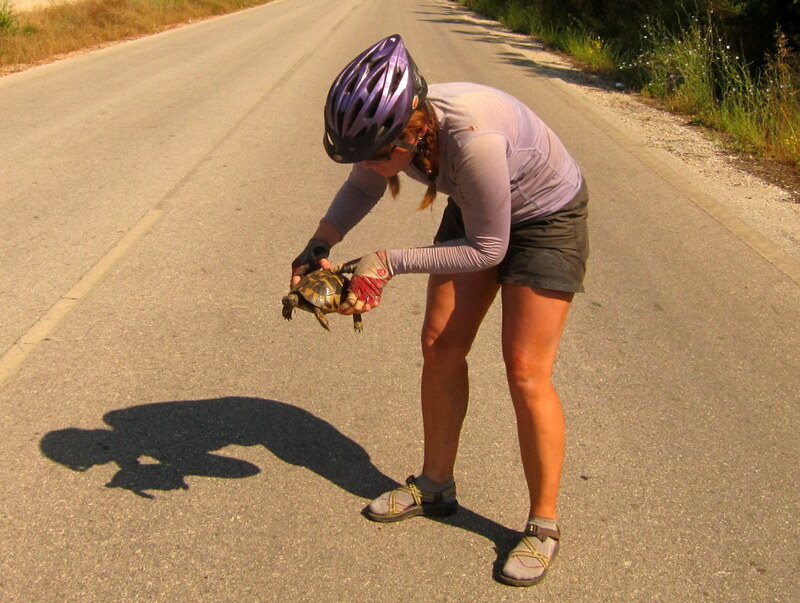 When we rode up to each turtle, it would usually spot us and hideaway in its shell right in the middle of the road so we had to stop and help. If the turtle didn’t notice us and kept moving, we would just hang out and make sure it got to safety without any cars coming. A couple of times we acted as a temporary roadblock diverting traffic around the turtle, while the drivers just gave us a weird look. Our destination for the day was Ioannina, which was the last big town we’d hit before crossing into Albania. As usual we stuck to the back roads. Chandler noticed a bit of a shortcut on the GPS which cut out several miles and decided to follow it. 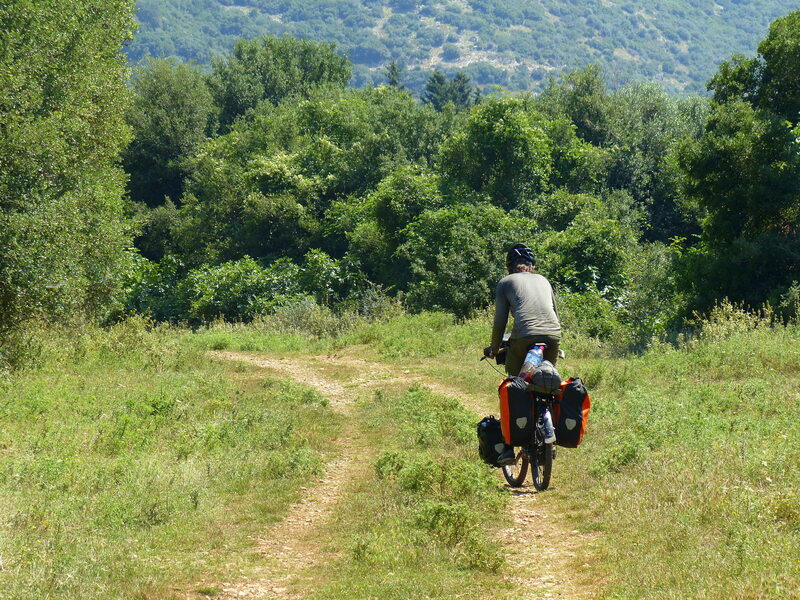 The road deteriorated into a gravel path and we resorted to pushing the bikes up the hill. I wasn’t sure we were on the correct path, but thankfully, Chandler’s shortcut did bring us out on the road. The heat was tremendous and the road appeared to go straight up. There was no shade and I was so miserable. Chandler was so far ahead of me, I was sure I would never catch up to him. At the top of the short hill, I was crying and Chandler was waiting off the road under the only tree for the last mile with a giant bottle of Tang he mixed up. When I got close, he ran out of the shade and grabbed my bike so I could get some relief. After drinking the entire bottle of Tang and an additional liter of water, we were concerned about how much water we were going through. Our shirts were completely saturated with sweat despite the direct sun which usually keeps out backs dry, so we were obviously dumping water almost as quickly as we were drinking it. At the next village, we approached a house with two men drinking beer and eating on the patio. I walked up shaking an empty bottle and asked “nero?” The owner, Dmitrius, came out, spoke great English and filled all our bottles. He was very curious about our journey and we sat in the shade relaxing and chatting. His son had cycled to Iaonnina before so we got some information about how far and how high we had to go. We have many more miles to cover so we had to leave after just a few minutes. Dmitrius asks if he can take our photo, headed into the house and returned with a camera and a bag full of tomatoes and a cucumber for us. Feeling refreshed and grateful for Dmitrius’ generosity, we start up the next mountain. The grade was mellow, but the sun was brutal. There was absolutely no shade and no breeze, so the climbing was hard. Chandler is a much stronger climber than I am and far ahead of me, so I was free to cry without worrying him. I pretty much cried my whole way up the hill. 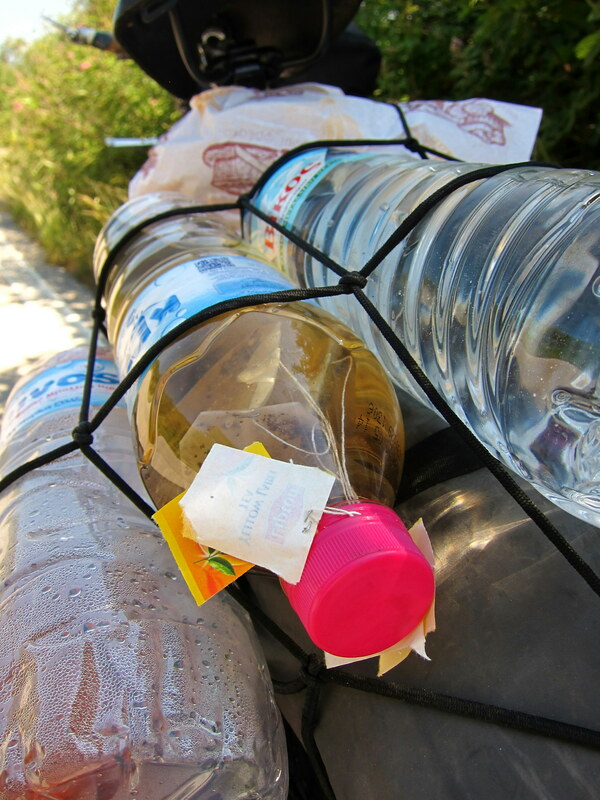 Even though I drank several liters of water, I felt like I was going to pass out from dehydration. On the last bend, I noticed a series of switchbacks leading even higher up the mountain, which was the last straw and I just began sobbing. Just a bit further along, I saw another road actually heading down the mountain, which I hoped was the primary road. I also noticed Chandler’s bike parked on the side of the road with him clinging to the side of a small rock underneath a tiny bush. The bush produced the smallest amount a shade, but it was enough to cover both of us. When I pulled up to Chan’s bike, he jumped out of the shade and grabbed my bike and again sent me to the shade while he took care of everything. As he made us a bread, oil, tomato and feta snack, he told me that before he saw the bush he actually considered crouching in the miniscule shade next to some beehives, just to get some relief. Feeling much better after our break, we pedaled off under the blazing sun, but this time heading down the hill. Our relief was temporary as we soon began slowly climbing uphill again. 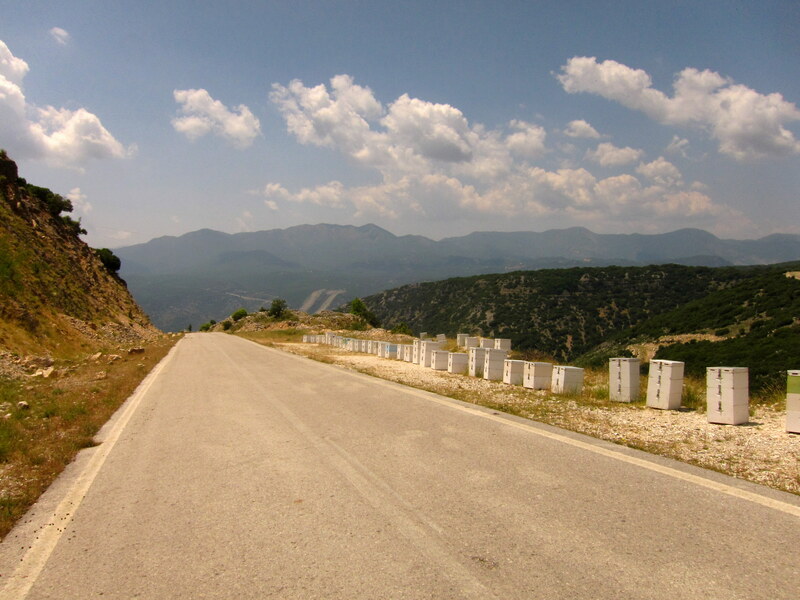 We had assumed it was all downhill to Ioannina after we made it over the pass, so we were especially disappointed to be working so hard. 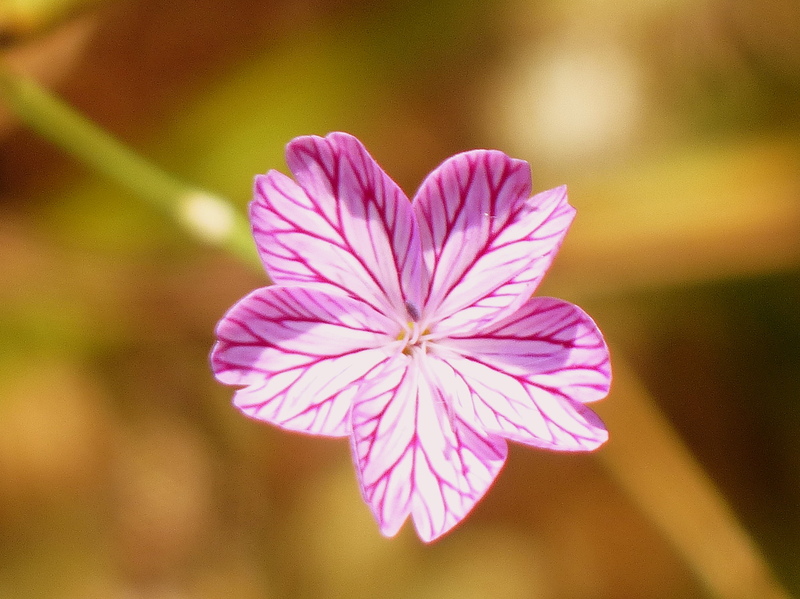 Just as I had begun to cry again, we spotted a spring on the side of the road. It may have been a blessed spring as it was right next to a small stone church in the middle of nowhere. We filled all our empty bottles, drank and drank and drank and refilled. We splashed or faces and hair with the cool water. It is really amazing how much better we feel after putting water on our bodies. Finally on our last push to town, we started talking about pizza. We decided that we would eat an entire pizza each ourselves. We opted for a route through a farming neighborhood instead of the highway. The road naturally took us over another giant hill. At this point, we just laughed at how ridiculous the day turned out. The last few miles into town are thankfully all downhill. Once in town, we pull over at the first pizza place. The owners are hanging around outside and watch as we park our bikes, take off helmets and gloves and prepare to sit down. Chan goes to order when the woman says that the place is closed. That was the straw that broke the camel’s back and I started crying again. I was turning into such a baby. I cried the next 3 miles through town when Chandler noticed another pizza place. After confirming with the young guy running the place that the joint was open, we ordered a large margarita pizza each. The pizza was really good, and worth the splurge. Everything was right in the world again. We found a room no problem right next to some sort of cave and settled in for a relaxing night. We rose early and made a quick breakfast next to the tennis courts. It was a short ride over to Agrinos where we stopped for some coffee and wifi at a little café. We didn’t have much of a plan for the day, except to avoid the highway at all costs. As we were pulling up Google maps, the internet went out and never came back, so we were left with the line map on the GPS, which doesn’t have elevation contours. We picked a route with minimal squiggles hoping this meant it would be a less mountainous route. 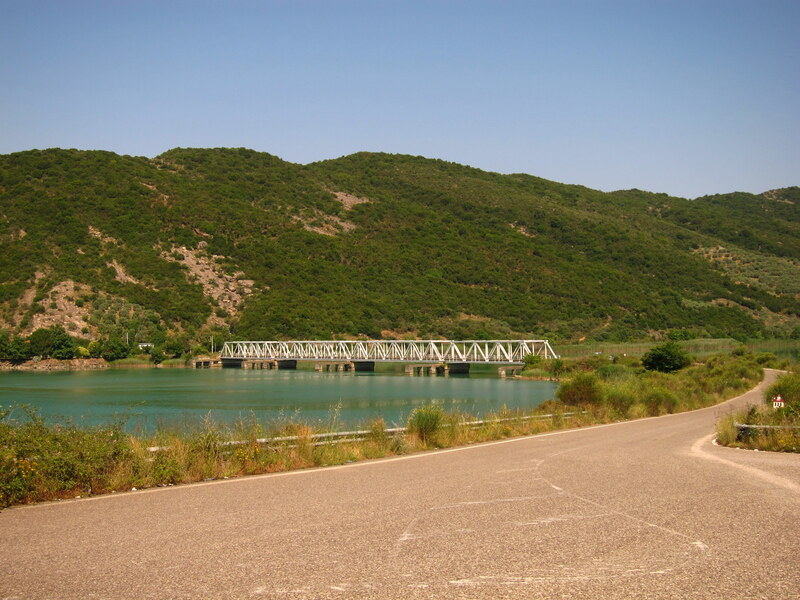 The road rolled through small hills along some reservoirs which must have been part of some hydroelectric scheme. As we swung around a bend we saw a small vegetable stand. We really love buying our produce as locally as possible because the quality is usually better and so are the prices. It’s always a fun social interaction too, where we learn the local names for things, and promptly forget them. 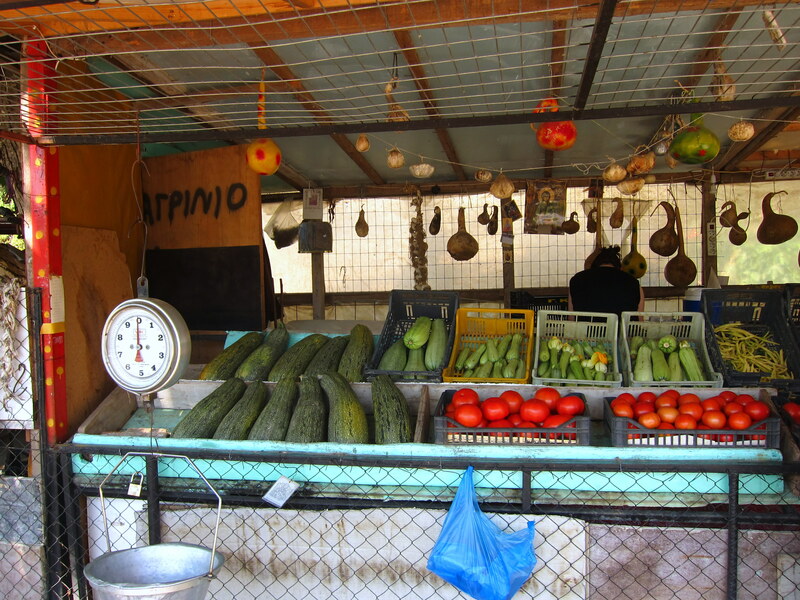 We’ve barely seen any produce stands in Greece compared to the hundreds we saw in Turkey. There are a lot more supermarkets and centralized shopping centers here, so most people must get their veggies there. The lady running the stand at first came across as pretty brusque and unfriendly, but as we lingered a little while we could see she was amused that we had stopped by. She showed us the water spigot to fill our bottles. We pulled out our nearly empty bottle of olive oil in the hopes she would have some for sale. She called down her daughter from the house, who disappeared with our bottle and came back after a few minutes with it filled up. I pulled out 10 Euros, but the lady waved me off, still not smiling. 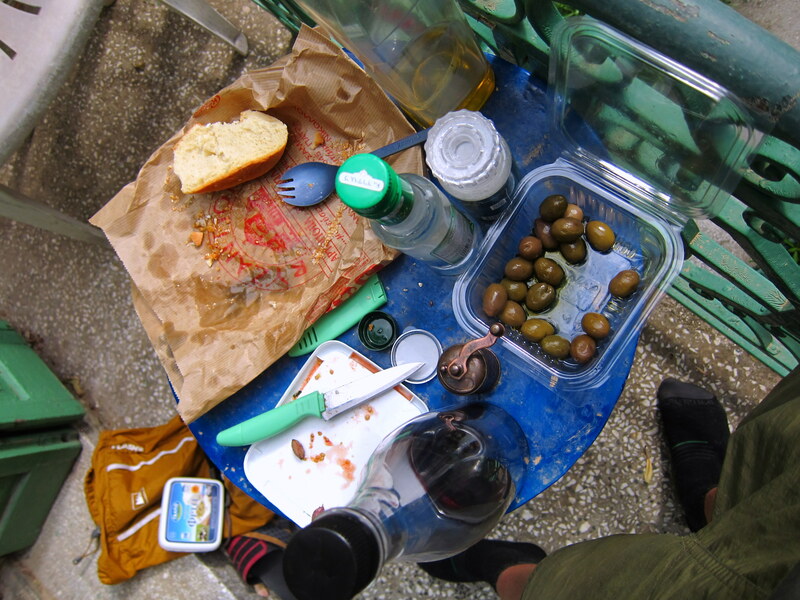 We rode off loaded with fresh eggplant, potatoes, tomatoes and sweet green peppers, cold water and a liter of olive oil. We learned that you don’t have to be friendly to be kind and generous. The riding slowly climbed up a narrow valley and traffic was really light. We came into a small town next to a large lake which had really splendid views. We saw the valley opened up but off in the distance an imposing wall of mountains bounded the edge we were shooting for. We realized we should probably escape the valley before we ended up having to ride through some big pass in those mountains. 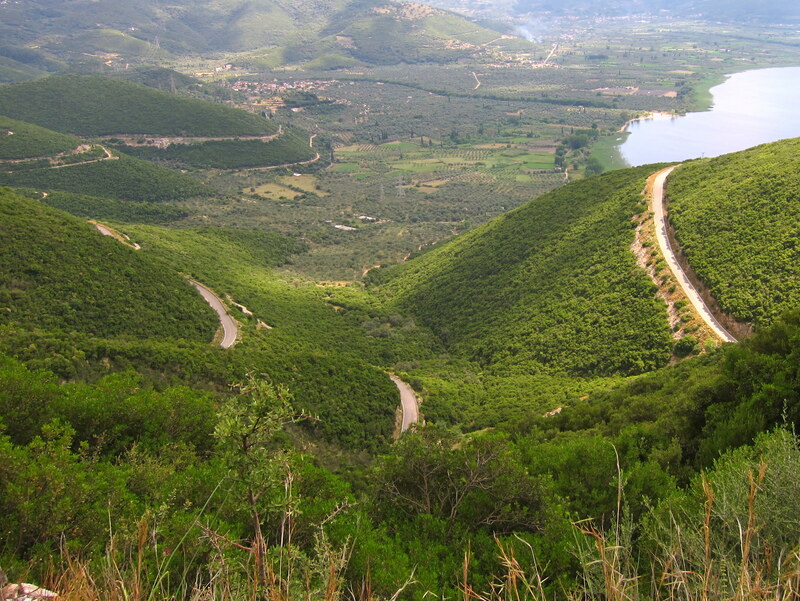 We took a left and climbed and climbed on the very steep, but well paved road. It was déjà-vu from yesterday and wasn’t exactly “fun”, but we were still happy with our trade of miserable highway traffic for near solitude at the price of lots and lots of climbing. We crested the ridge and then descended through a few small towns where people sitting at cafes and at their houses waved to us, as long as we initiated the wave. I heard a scream from behind me, so I hit the brakes and turned around. Jenny was still upright, so that was a relief. 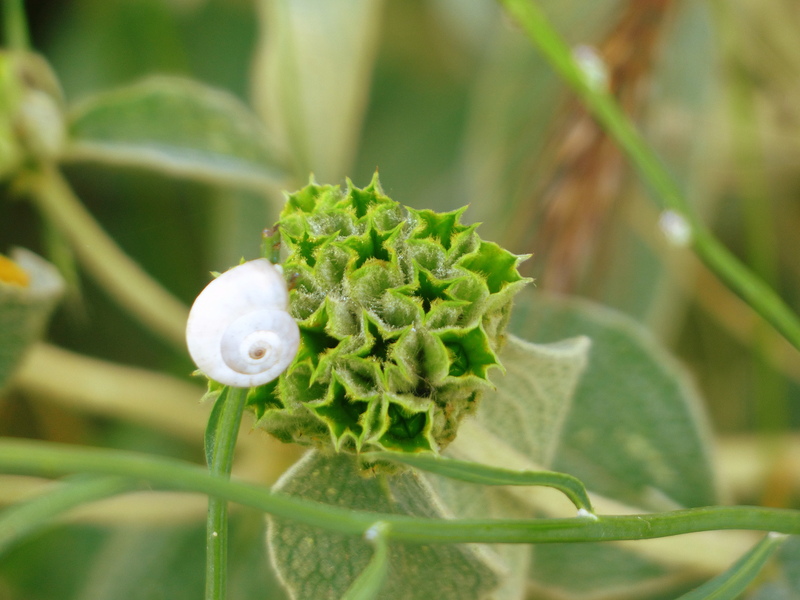 She rode up with tears in her eyes, and said she had been stung by a bee! We get wacked by all kinds of bugs while riding downhill, but this bee had managed to sting her thigh during its brief impact. This was the first time Jenny had ever been stung by a bee, so we were a little worried at first. We do have an epi-pen with us for emergencies since she is allergic to a lot of random things, but the spot just swelled up a tiny bit and she didn’t have a seizure or anything so on we went. After some strategic meandering, we were eventually forced back on the highway. The road followed the coast for a while and gave some nice views, but it was hard to take in while concentrating on hugging the shoulder. I think a lot of people tour on highways and just get used to it, but we really like quiet roads even if they aren’t direct. Because we spend so much time on small roads, our misery is amplified when we do have to ride on the highway, so it wasn’t long before our moods sank and we just rode along in autopilot. 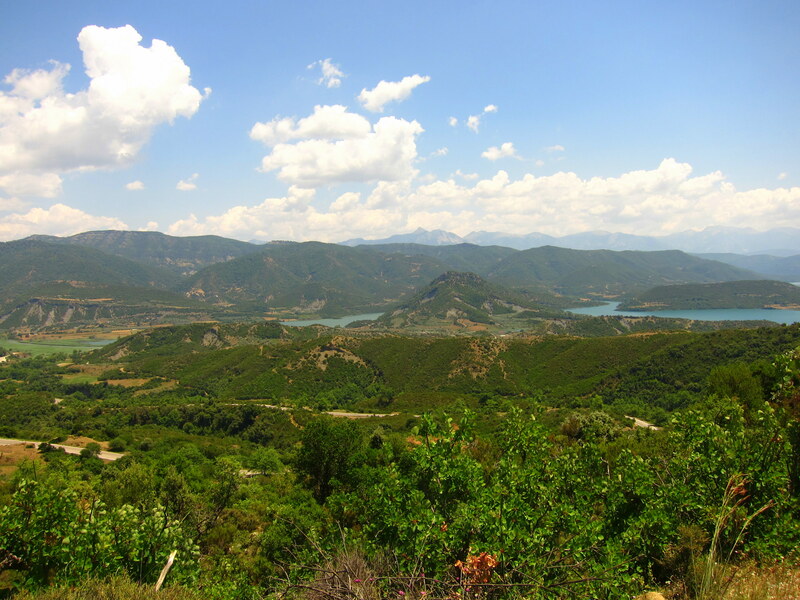 We hit 50 miles in an agricultural region just south of Arta, which looked like a decent sized town on the map. 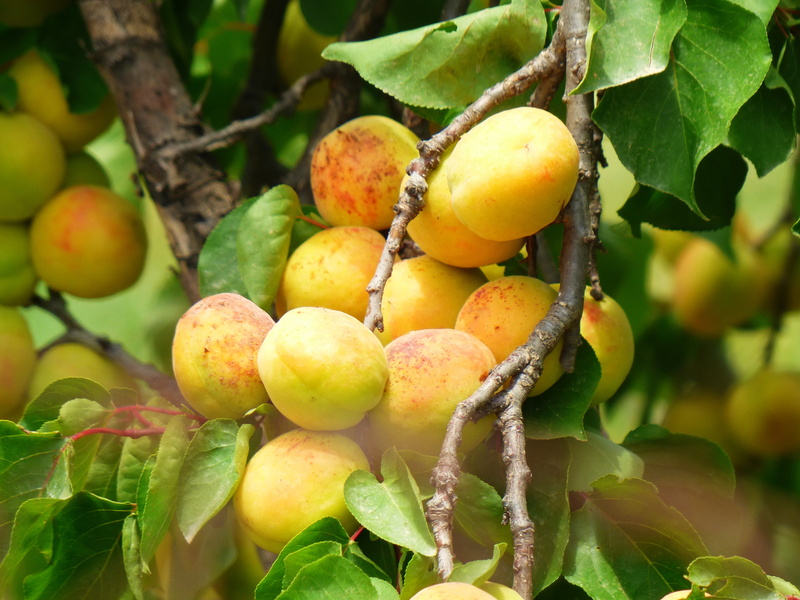 The crops were oranges and olives here, and it was full swing orange season. 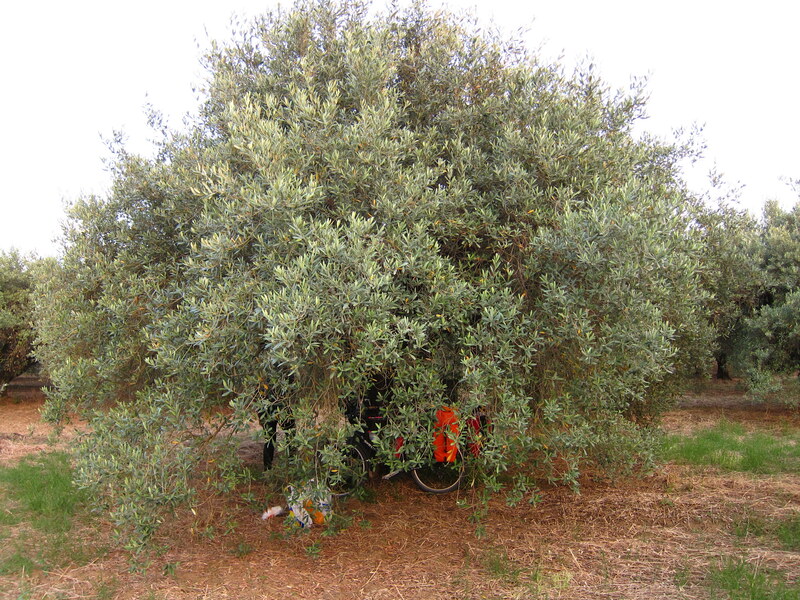 Since everyone seemed preoccupied with tending the oranges, we ducked into an olive orchard and tucked ourselves away in the back corner out of view of the road. Soon we had the hammocks set up in one of the trees and we took a nice break reading before cooking up a big pasta, cheese and veggie diner. It was another long day of climbing, but we were feeling a lot better about Greece. We weren’t charmed out of our socks, but the views were fantastic and when we were off the highway we really enjoyed the cycling. We spent a while discussing where we were going to go. After our less than spectacular tour from Athens to Patras, we were ready to hop on the first ferry to Italy. This was compounded by the fact that the busy highway crossed the bridge at Rios and headed north with no secondary road options. 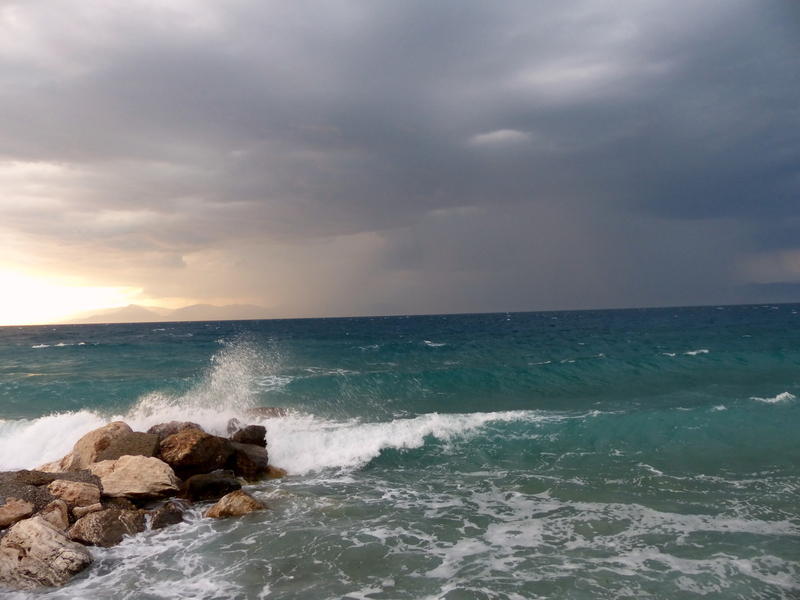 Ultimately, we decided that we didn’t want to leave Greece with negative feelings, so we would give it another go through the interior of the north-west. We were immediately frustrated once we started looking for a route. Everywhere else we have toured, when there is a highway, there is usually a secondary road, ideally paralleling the major road, but if not there is usually a network of local roads that tie in from community to community that we can make our way through. In Greece, it seems like they just expand the local road and tie everything into the main trunk without much in the way of alternate routes. Maybe an interesting topic for a master’s thesis in urban design or something… Anyways, the only alternate route was a small mountainous road in a totally different valley. 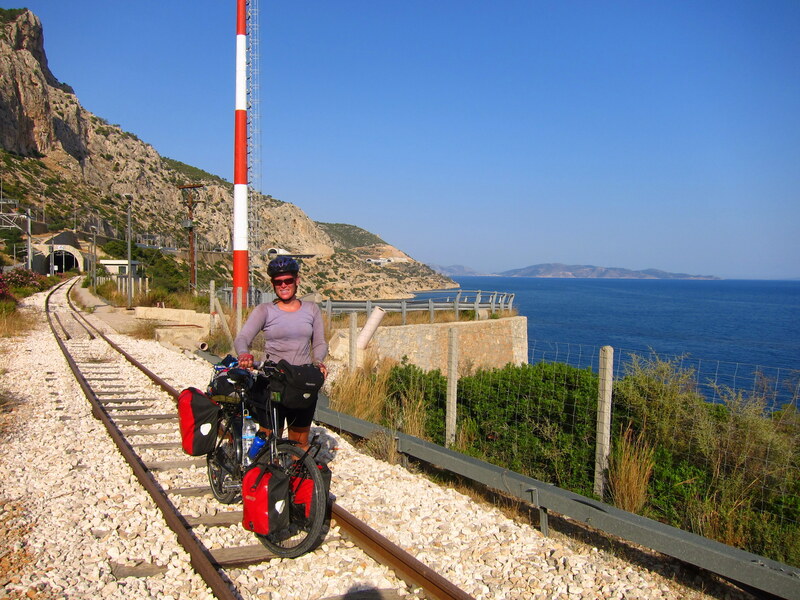 We had to backtrack to Rio and cross the Gulf of Patras to head north to Albania. We also realized we were going to have to put in some serious miles if we wanted to go to Amsterdam and make it to France in time to meet up with my step sister and her family on their vacation. After looking at the map, we decided we needed to ride on a schedule of 50 miles every day for three days, before taking a rest day. Considering how we were feeling about Greece, it wasn’t going to be a problem to make a beeline. We made quick work of our ride back to Rio and figured out how to get on the bridge. 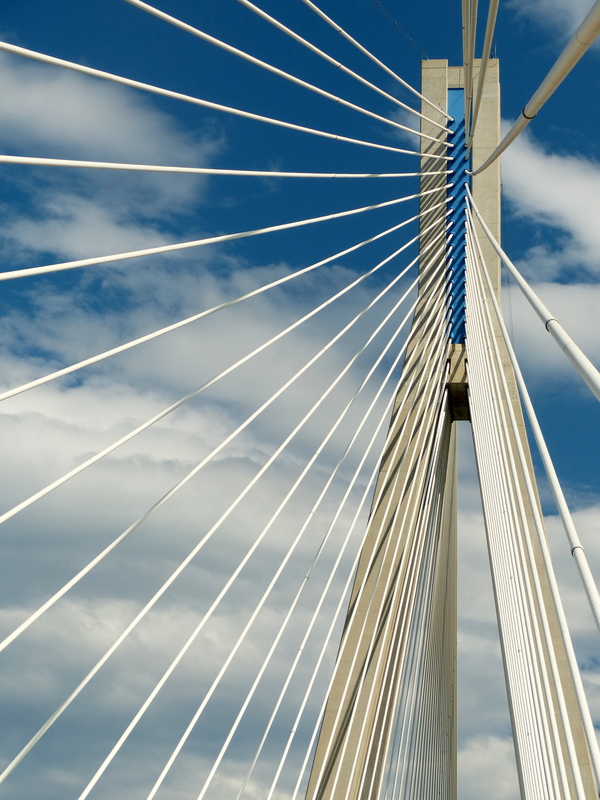 It was a really spectacular bridge, finished in 2004. Apparently there is a hefty toll, so it hasn’t put the ferries out of business. There was a pedestrian lane, but was accessed by stairs and isolated from the travel lanes by a large barrier, so we rode with the traffic, which was light. There was some confusion at the toll gate: first the toll taker waved us over, but then a big truck was bearing down on us, so she frantically waved us to the side. We ended up stranded in the employee parking lot, but were rescued by some bridge inspectors who activated the gate and let us back out on the road. We rolled along some local roads and stopped at the first place we saw serving coffee. 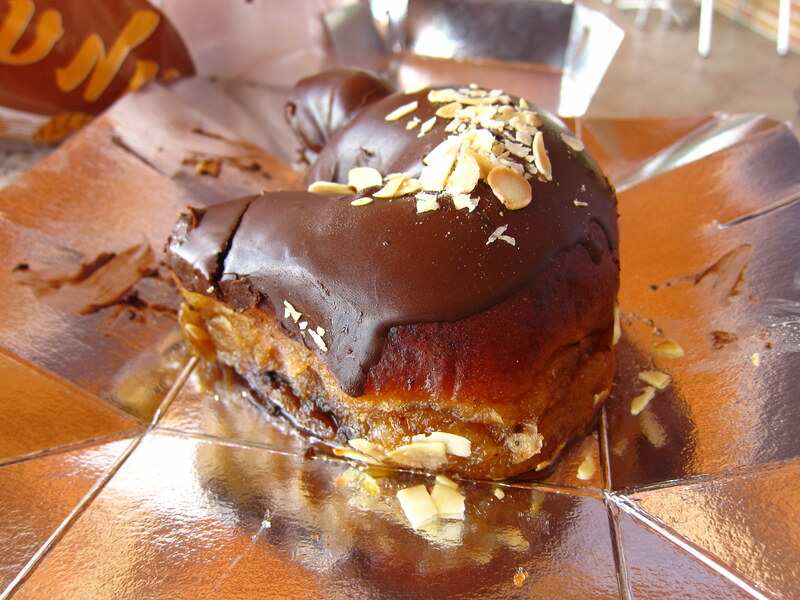 The coffee shop was also a massive bakery with dozens of breads, desert pastries and savory pies. We settled on a cheese pie, a cheese and ham pie and a most amazing chocolate pastry which was like an iced doughnut soaked in honey and lemon. We were reluctant to leave the bakery, but had a lot of miles to cover. We headed off the main highway into the hills. Without the traffic, we both noticed an immediate change and began to enjoy ourselves again. Some linemen working on a new high-tension power line tower spotted us from a hundred feet up and gave us a hearty shout and wave. The temperature was beginning to soar just as we started climbing a hill. We stopped for a break in the shade and spotted a spring off the side of the road. Someone had diverted the spring behind a masonry wall which poured water out of a small stone bowl. It was perfect for filling water bottles and splashing our faces to cool off. 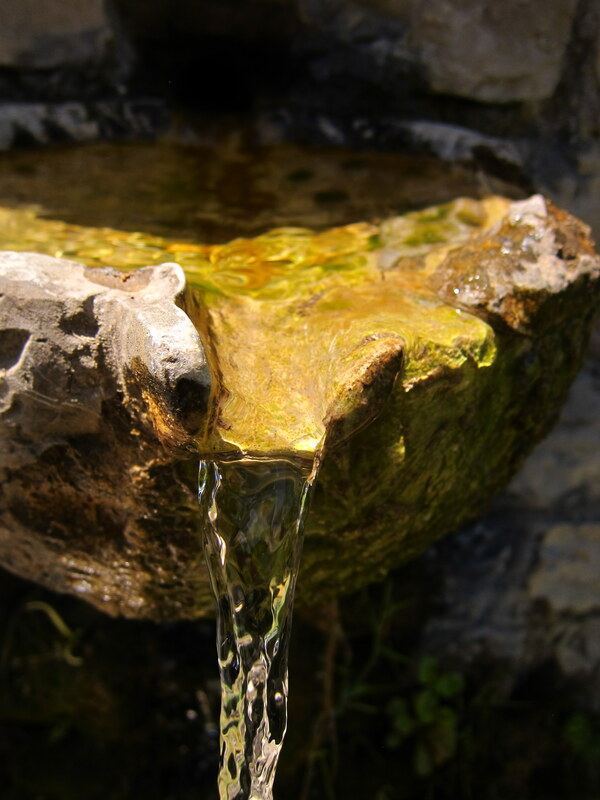 We weren’t sure if the water was clean, so we purified it with the Steripen and were happy to find out it tasted great. Feeling refreshed, we continued on up the hill. We ended up climbing almost 1,000 feet and enjoyed beautiful views of the mountains and an inviting river below. Soon, we were flying down the hill and losing all the vert we had just gained. As we approached the river, I hoped we would end up following it closely. However, we began climbing back up immediately. The climbing started out easy and it was only the heat that was troubling. Suddenly, the road went from a mellow grade of about 5% to a grueling 10%+. I could barely keep enough speed up to stay balanced. We had to take several breaks whenever there as any shade on the road. Even Chandler was making switchbacks on the lane to make it easier to ride up. I was cursing who ever designed this stupid road. Eventually, we made it to the top after climbing another 1,500 feet or so and I was so tired I just wanted to be done. We still had several miles to go before we reached our 50 mile goal. We wound down out of the mountains and along a reservoir. There were a few good campsites, but we pressed on. When we hit 50 miles, of course we were in the middle of a pretty large town, so we kept riding until Chan consulted the GPS and saw we were riding towards an even bigger town, not good. After a few more miles, we reached a bridge spanning a river we thought might be an option. There were houses crowding the banks of the river and I was sure we would be biking forever at this point. 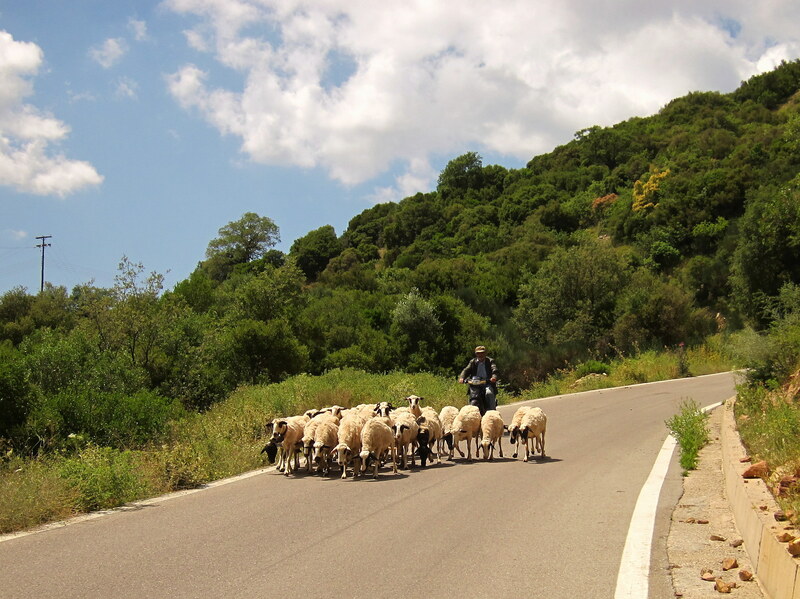 As soon as I gave up all hope of ending soon, we pulled up beside an overgrown olive grove. We gave each other one look, waited until there was no traffic passing and quickly crashed our way into the trees. The spot ended up being perfect. There was a weird tennis court and a partially constructed concrete club house or something built within the olive trees. The whole thing looked totally abandoned, except the tennis courts were swept. We set up camp in the concrete building where we had flat ground and a great hiding spot for the night. Chandler made dinner as I set up the tent. We ate, cleaned up and fell asleep after the sun set. We woke up early with the sun and hustled to get on the road. Chandler made breakfast while I broke down the tent and deflated the sleeping mats. We have a pretty good system at this point and things move along efficiently. Once I am done putting everything away, Chan had the food ready. We ate and hit the road. Chandler got ahead of me right away as I was slow to start and get my muscles loosened. I was a little surprised when I noticed Chandler stopped for a break so soon after starting. Then I noticed a tiny little animal wandering in the middle of the street. It was a kitty and Chandler had stopped to ensure its safety. 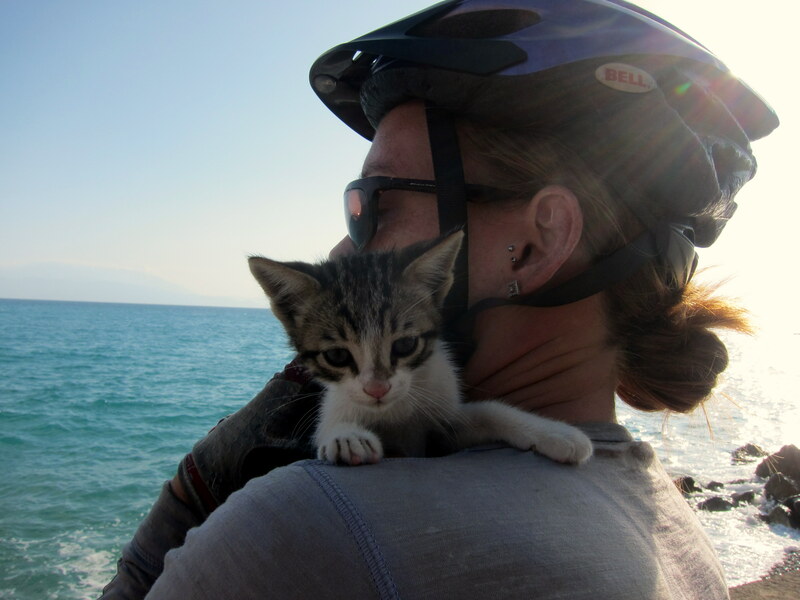 I immediately got off my bike and scooped the kitten up for a cuddle. I also noticed that the kitty had a friend lingering on the sidewalk. I put down the first next to her friend and said goodbye. The kitty had another idea and followed me back into the road. If we had been at home, I would have taken these sweet kitties home or to the animal shelter, but those options were not available to us. There was nobody around, so I could only assume these were strays and knew there was little I could do for them. After several attempts to keep the kittens off the street, Chandler finally ripped off a huge chunk of bread and threw it into the bushes, which the kittens promptly attacked. We pedaled off quickly with hopes that the kitties would be ok.
Our ride continued along the coast on a heavy traffic road against a strong headwind. We tried to remain positive but it was frustrating with giant trucks thundering past us at top speeds and every other vehicle passing too close. At one point, a semi pulling two trailers passed us around a curve and its rear wheels cut across the edge of the pavement and forced us off the road. Not cool! 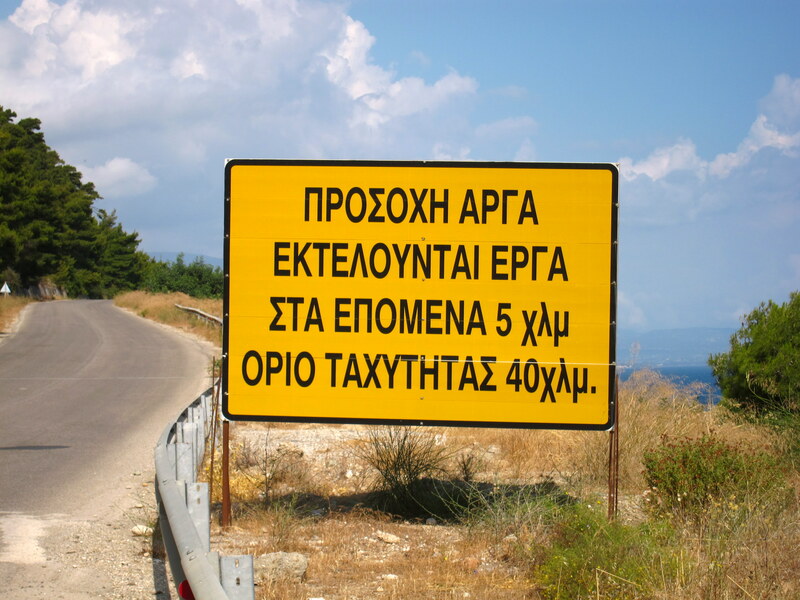 During trying times like that, I tried to focus on reading the signs in Greek or pretending they are math problems. Due to all the math/physics/engineering classes Chandler and I have taken, we are pretty familiar with the Greek alphabet and surprised ourselves with how easy it was to sound out the words, not that we have much idea what they mean most of the time. It dawned on us after seeing lots of signs that said: καφέ. Kappa, alpha, phi, epsilon sounds like k-ah-fee… coffee! At some point, some large dark clouds filled the sky as Chandler and I were taking a snack break. Deciding it was probably going to rain, we put our raincoats in a place to grab them easily. 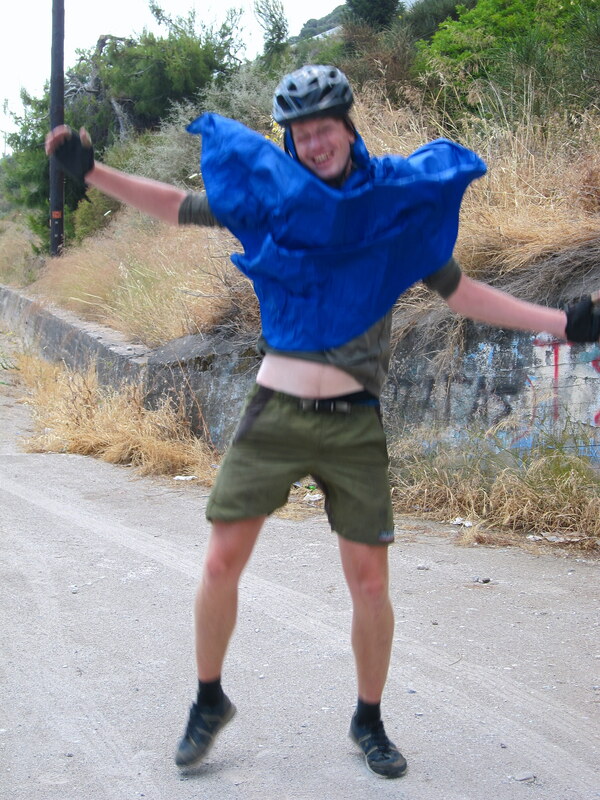 Chandler decided it was a perfect opportunity to try out his new bicycle rain poncho, which he purchased back in China. After trying it on, we had a little photo session which included lots of laughter and for some reason, jumping. A short while later, the rain started. Chan was pretty pleased with himself in his poncho. Then we passed a few teenage boys riding quickly through the rain without any protection, but were very friendly and in good spirits. I was ahead of Chan at the time and stopped when the short shower passed over us to remove my jacket. I asked if he had seen the boys and he replied that he was never wearing his poncho again because the kids had made fun of him. The whole area was pretty developed and the couple of vacant lots by the ferry landing were occupied by camped out Gypsy families who always tail us around asking for money. So we started to look for a hotel for the night. We swung by both hotels in town, but they were both 40€, which is way out of our price range. The GPS had another hotel a few kilometers outside of town and figured to head that way. The hotel outside of town turned out to be a super swanky hotel and casino. We didn’t bother asking the price, it was obvious we couldn’t afford it. The rain had stopped again, so we hung out in the parking lot for a snack and to go over our options. We could either go back to the first hotel or try a few other hotels listed in the GPS. Not wanting to back track, so we moved to the next hotel. The next hotel turned out to be 45€ and the one after that was 50€. 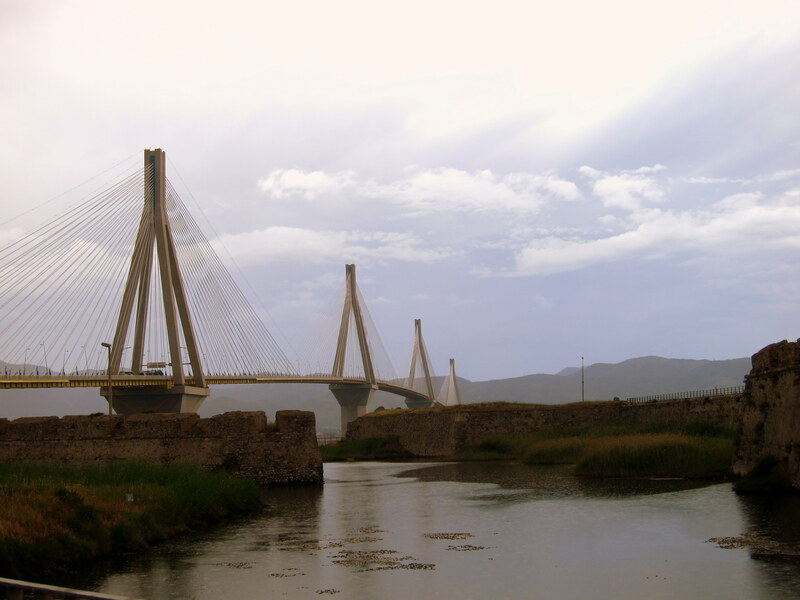 I was getting quite discouraged at this point and just wanted to head back to Rio, but after our experience on the highway we were strongly considering ferrying out of Greece and the port at Patras was just a couple miles further. As we continued down the road, we came upon a huge park, but there were people everywhere running, walking and biking. The GPS listed another hotel nearby, so we headed in that direction. The price was again out of our range, but Chan promised we would try one last place before we made a decision. 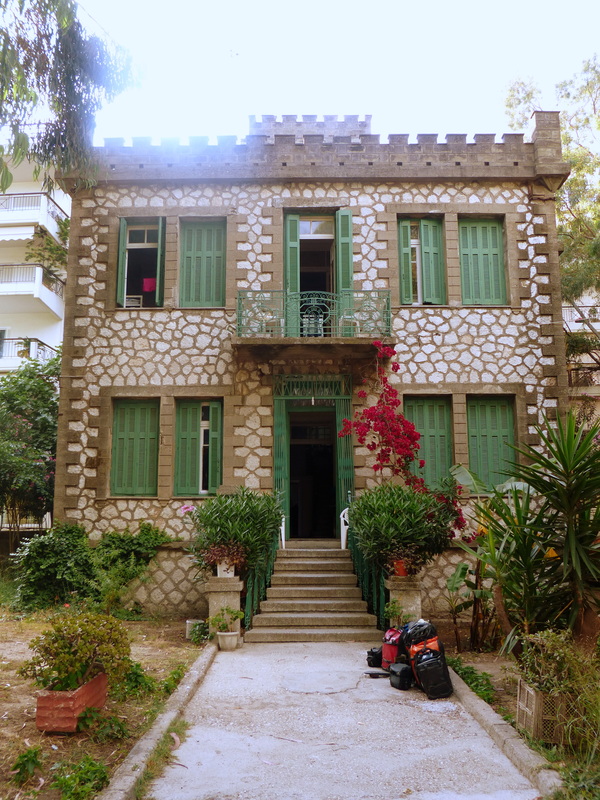 The next place ended up being a quiet little hostel with a more budget friendly price of only 24€. 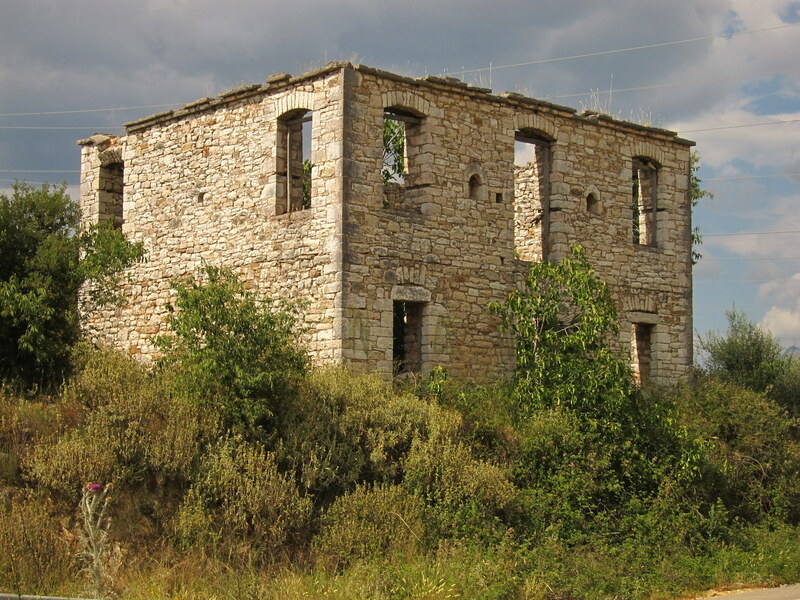 The hostel building was an imposing old masonry structure that was apparently Nazi headquarters for the region during WWII. We were glad to be off the bikes for the day, and to have a shower and wifi. Our room had a nice little balcony overlooking the harbor where we sat and munched on olives and drank cheap rough wine. We watched the sun set and decided to take the next day off while we figured out what to do. Jenny and I enjoyed a nice leisurely breakfast of eggs and fried potatoes at our campsite next to the abandoned railroad tracks. There were active trains on a set of tracks on the other side of a small berm from where we were, but we only heard them a couple of times, and the trains were really short. Things did not seem well in the world of Greek trains. We got on the road and made good time headed west. There were great views of the ocean as we rode along, bouncing between small towns. The views were nice but nothing really stuck in our minds about it. 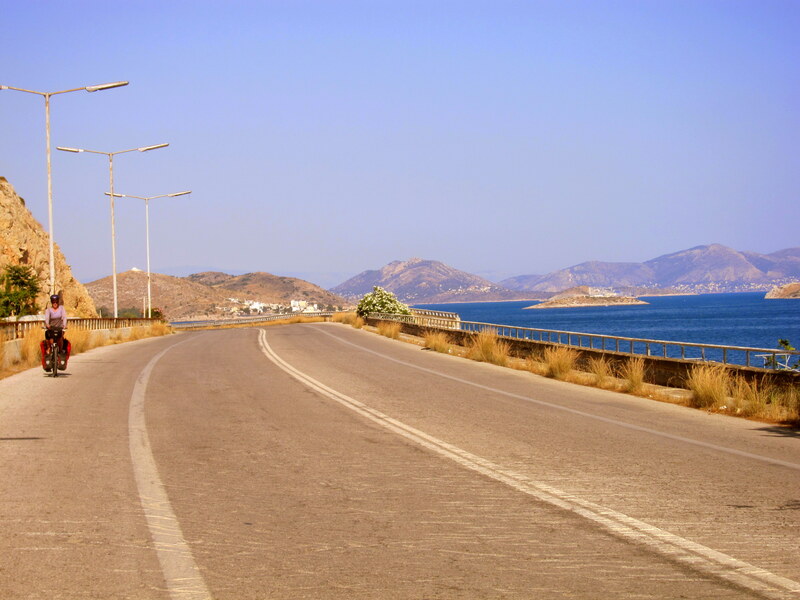 After a little while, we realized we were approaching Corinth, which is located at the skinniest point of the isthmus that connects mainland Greece to the Peloponnese. This was an important shortcut overland for traders for a long time, and the French eventually built a deep canal here in the 1800’s. I was interested in lingering a little bit to take in some of the bridges and the canal itself, but instead DISASTER STRUCK!! We were all the way at the south end of the canal on a small side road with almost no traffic. We rode down a small incline to the wooden bridge deck. I looked to my right and saw the line of the canal, and the perfect picture I could take. Unfortunately, a quick glance behind me revealed a car behind us so I turned forward and kept riding. At this moment, I heard a yelp behind me from Jenny, so I hit the brakes, but it didn’t matter because my rear tire had already slid between the slippery wet wooden planks of the bridge, bottoming out my bike on my panniers and stopping me abruptly. I turned and saw Jenny’s front wheel spin to the side wildly and down she went with a scream. The car behind us stopped without a problem and Jenny got up without injury, I was able to unwedge my bike from the bridge and get off the damn thing pretty quickly. I tried to get us sorted out on the far side, but Jenny was pretty shaken up and wanted to JUST RIDE! So we did. After some research we realized that the bridge deck was wet because it was a “submersible bridge” which is lowered underwater allowing ships to pass over it. We discovered at least one design flaw. 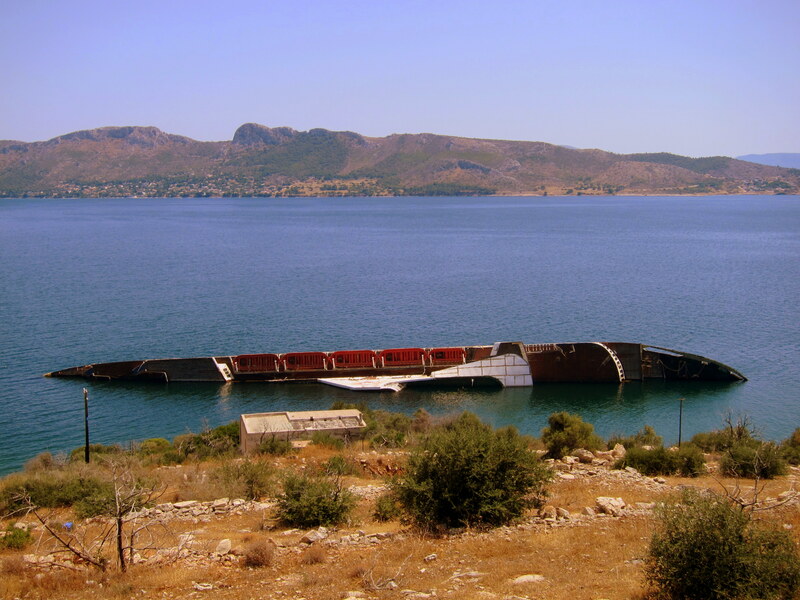 Anyways, we’ll never forget the canal at Corinth, although we didn’t get the best look at it. 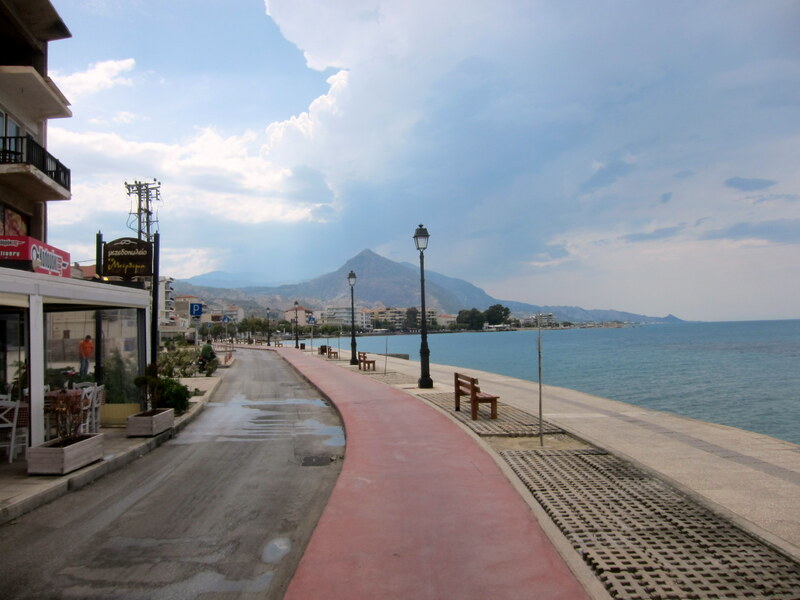 The part of Corinth we rode through didn’t compel us to stop, so on we went. We had a nice tail wind and the north shore was pretty, winding along right next to the ocean. 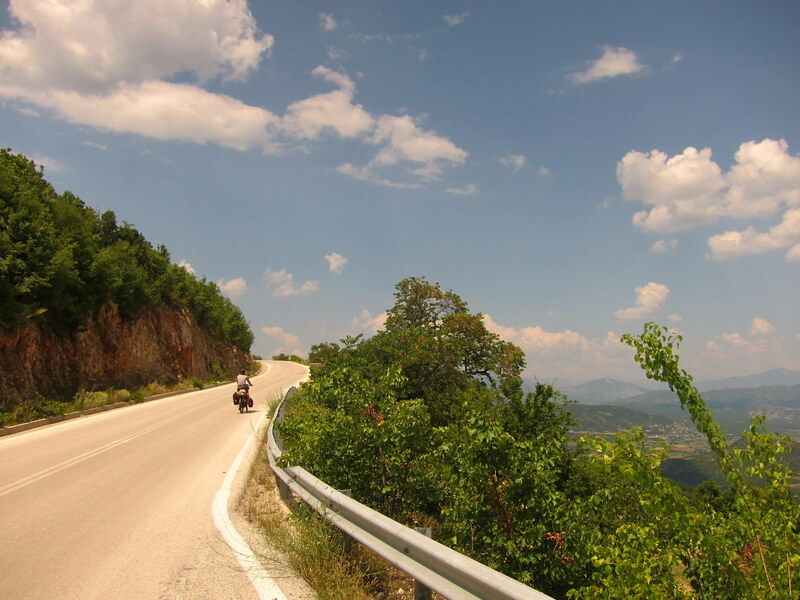 The highway was really bad for riding, with lots of trucks and people driving with the sprite of want to be F1 drivers, so we spent a great deal of time consulting the GPS and riding on local roads that kept us on the water, but frustratingly repeatedly dumped us back on the highway. We struggled to describe to each other how we felt about this area, it was beautiful coast line with beaches and people swimming, but it was SO developed. Every foot of the way was someone’s house, hotel, bar or restaurant. It was relentless and monotonous as each town blended seamlessly into the next. We stopped at a Lidl, which is the el cheapo grocery store of choice in these parts to stock up. 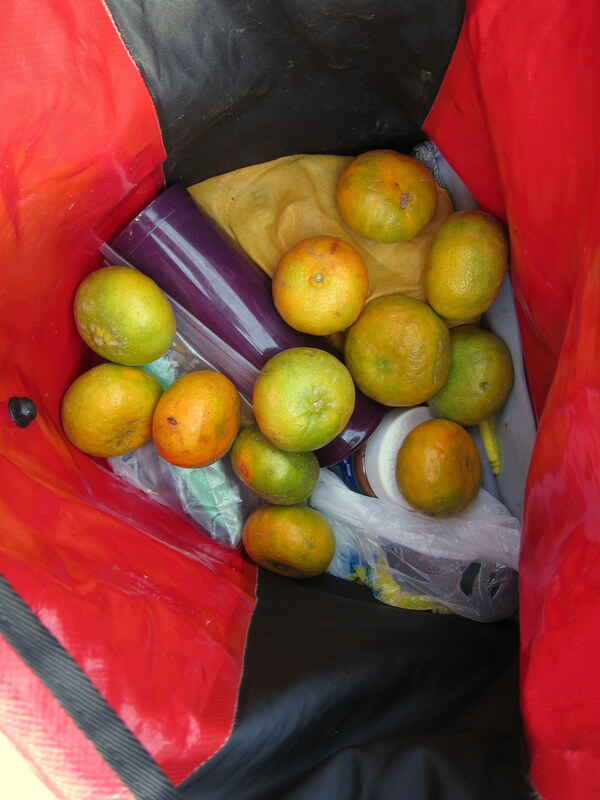 While we were packing up our groceries, a young man pulled a bucket of small oranges out of his hatchback and motioned for us to take some. We politely took four or five while he proceeded to dump handfuls into Jenny’s pannier until we had to ask him to stop, or else we wouldn’t be able to fit our groceries. We continued along becoming more and more worried about finding a place to sleep. There didn’t seem to be any campgrounds in this area. I spotted a section on the GPS that didn’t have the usual network of town roads, and hoped it was a river or some geographic feature that might give us some refuge. As we rounded a bend before we saw that is was a river, but our side was heavily built up with condos. The far side was more promising with a rambling treed area. The road down to the trees was gated at a building that looked like a beach side bar that hadn’t opened for the season. We saw an RV parked out front and noticed they had Austrian plates, so we ventured down for a chat. They were really nice retired folks on a ride through the Balkans with their two Labradors. It turned out they were spending the night in the parking lot of the not open bar, so we decided that we’d crash there too, somewhat shielded by their RV. After a few hours, a whipping storm came up, with lightning and sideways rain, so we put up our tent in the middle of the outdoor wet-bar pavilion, and made some dinner using their counter tops, which felt like a luxury after slicing endless vegetables on cutting boards on the ground. It was a peaceful night of sleep listening to the big surf crashing on the shore next to the bar. Athens apparently did not want us to leave and did everything in her power to stop us. About a block away from the hostel, Chandler dropped into his smallest rear cog ring and his bike produced an awful noise. He stopped to investigate and he noticed that the smallest cog was just spinning around and his cassette had come apart. We immediately pulled up on the curb and Chandler determined no major damage had occurred. 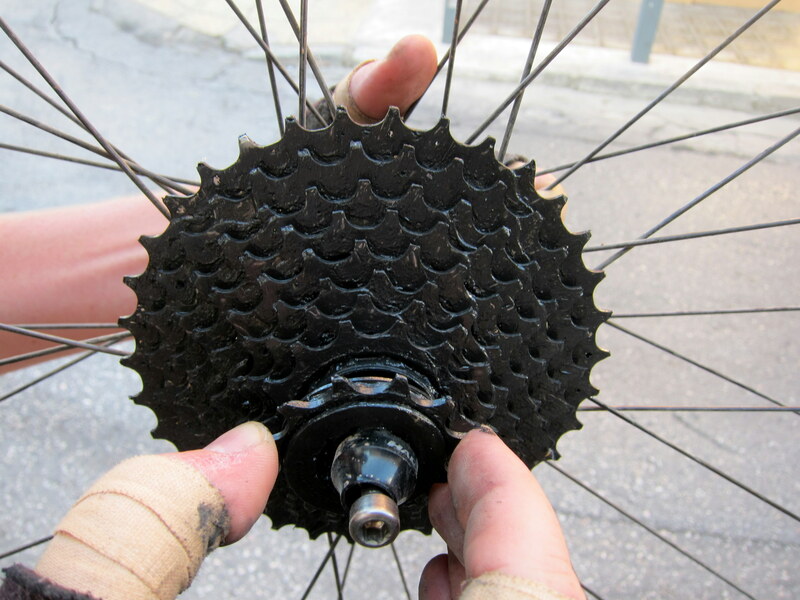 The stack of three small cog rings on the cassette had just come loose. We have a tool to re-tighten the cassette and after a few minutes of fiddling his bike was back together and we were back on the road. Is it supposed to do this? About two minutes later, I noticed my front tire was a little low. We pulled over at a gas station and sure enough I had run over a staple. We pulled it out with our mini-vice grips (indispensible), patched up the tube and inflated the tire with the air at the gas station. Back on the road and headed out of town. We made a stop at a little vegetable stand in the center of town to pick up groceries, then a bakery for more spinach pastry. Chandler spotted a bike shop so we stopped to pick up another chain to replace the spare I am currently using on my bike. A discussion between the owner and the employee ensued which is always a bad sign after asking the price of something. Not surprising, the chain was overpriced by about 10 Euro so we continued. Not two seconds after leaving, I heard a crunch and a familiar hissing sound. 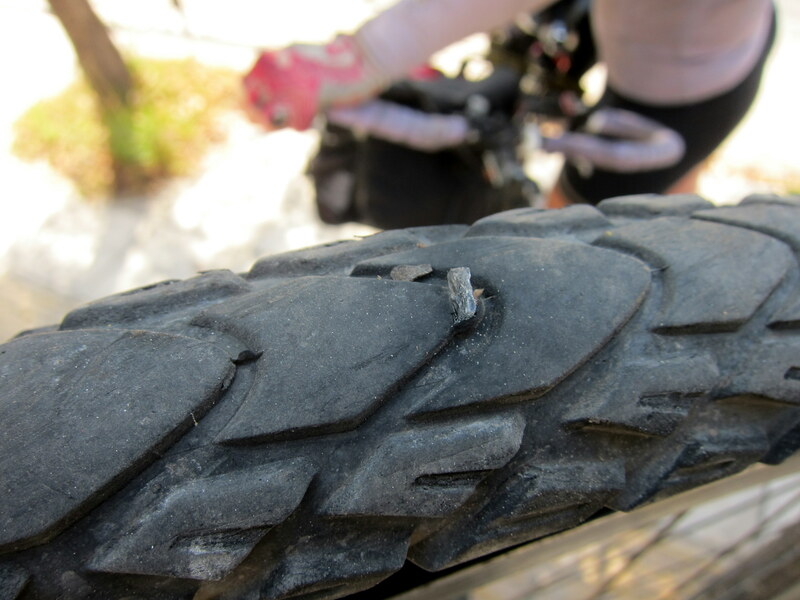 I had run over a small piece of glass which gouged a hole in my tire and punctured the tube. We couldn’t believe that after having only one flat tire in 5 months of riding in Asia, I got two flats within hours of each other. We quickly did the necessary repair work and continued on our way. We were getting pretty fed up of trying to get out the immense sprawl of Athens and stopped at a McD’s for ice cream. We felt better after our snack and Chandler found a more direct route on the GPS, so we headed off once again. 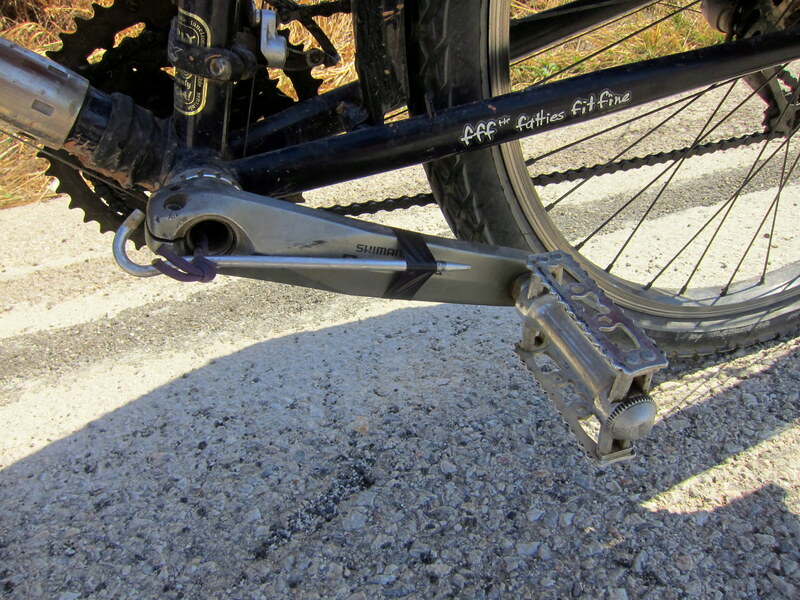 Then the Athens bike gnomes struck again as we were pedaling up a hill, my crank arm fell off. It wasn’t a huge deal (this happens all the time- both of our Shimano Hollow-tech II cranks are garbage and fall apart all the time, Chandler’s is currently held together with a piece of paracord, a tent-stake and electrical tape), but after all that had gone wrong, neither of us were in good moods. Finally, after several hours we made it out of the city only to find ourselves funneled onto a huge highway. Consulting the GPS, we found the highway was our only option for a few miles until we could get to a smaller frontage road. The traffic was fast and there was basically no shoulder. It was the only through road for miles, and didn’t seem to be designed so much as just evolved from a donkey path to major expressway, so gas stations and houses sat right on the roads which resulted in cars and trucks constantly merging in and peeling off at freeway speeds. Blessedly, we found a secondary road that actually appeared to connect to the next town on the GPS which turned out to be a service road for the sprawling oil refinery that dominated the shore in the area. When we finally left the highway, we were both out of breath, completely jacked up on adrenaline and cursing the traffic, the city and the country. It was the worst bit of riding of the entire trip so far, easily twice as bad as the closest contender: our day long stint on Highway 1 in Vietnam. Our spirits improved immediately once we were on the quieter road. While the traffic wasn’t any friendlier but there was less of it. 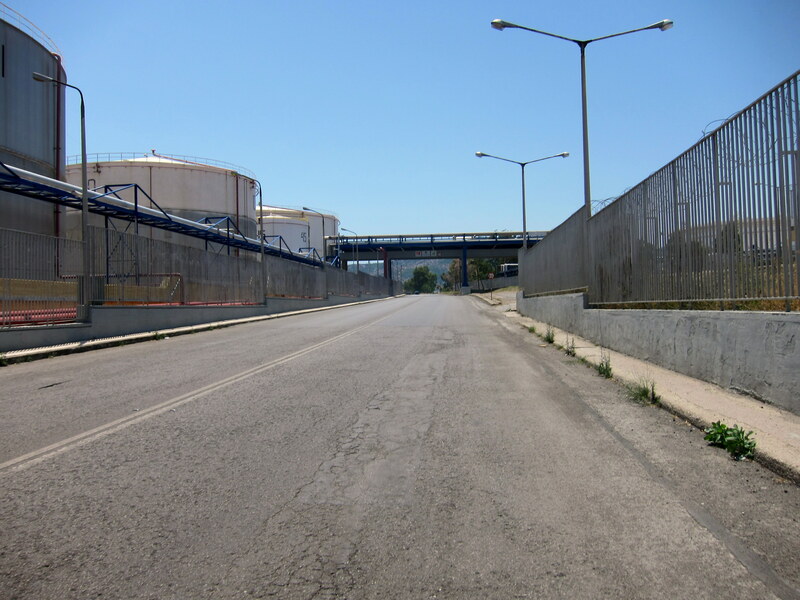 We had to travel through the oil refinery and the appending industrial slum, which was stinky and boring. We were beginning to doubt our choice of coming to Greece. We finally escaped the industrial maze and headed along the old highway 8 which was much more relaxing, though riding and scenery were pretty dull. We were in the small town of Neraki when my tire went flat again. Seriously, 3 in flats in one day? Luckily we were right in front of a gas station where the attendant was friendly and helpful. He had a small garage where he changed tires and it was immaculately clean, on an OCD level. The wrenches were all lined up perfectly in ascending order above his bench and the concrete floor was so immaculate you could eat off it. The mechanic let Chandler borrow a wrench to really tighten both of our cassettes. Back on the road again, the scenery changed and the riding was lovely. We spotted a small bike shop and picked up a chain for a perfectly reasonable price. The mechanic filled up our water bottles and sent us off with a wave. We were in a good mood now. Do we seem a little manic depressant? After awhile the road left the town and went straight along the coast. We had the sea to one side and big hills on the other blocking us from the main highway. The traffic started giving us more room and people started waving and returning our smiles. There were a couple of spectacular sections of road reminiscent of Highway 1 in California near Big Sur. We realized we were exhausted so we started to scout for campsites, which is always a challenge in steep terrain. Chandler noticed a road leading up to a radio antenna which are sometimes good low key places to find a place to camp. He rode up the hill to investigate. It was even better than he had thought! The antenna was right next to the unused small gauge rail line and the fence along the track was in a pretty bad state so it was easy to follow the tracks a few hundred feet or so down to a small clearing totally hidden away out of sight, perfect for camping and setting up hammocks. We even had a glimpse of the ocean through the trees. After a very trying day, we were more than happy to stop, relax and make dinner.